Cambodia is very known country for its temple but one must not forget that this country is not just about these structures and statues. Cambodia is more than those things. The country offers variety of food and dishes from their very own cuisine, classical show to watch for, night life to experience and a lot more. 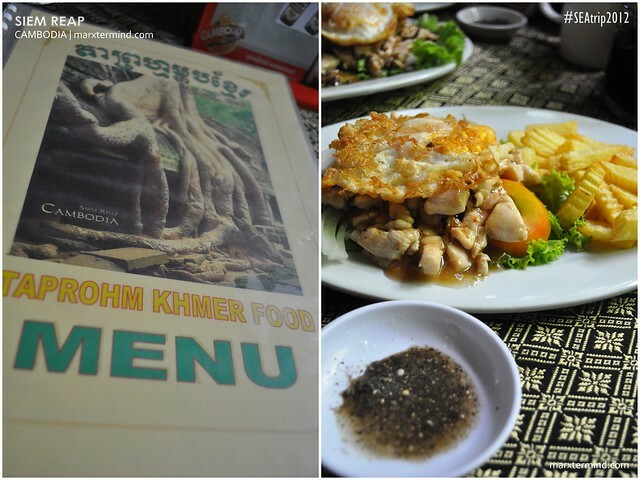 One of the popular dishes among the Cambodian cuisine that we had able to try is the Lok Lak. The dish is consists of a stir-fried marinated, cubed beef (or pork or chicken) served with onions, on a bed of lettuce, and tomatoes which is dipped in a sauce consisting of lime juice. This dish also has different variants distinguished by the addition of French fries and a fried egg. One of my companions ordered Curry but most of the ingredients are vegetables thus he wasn’t able to like it. 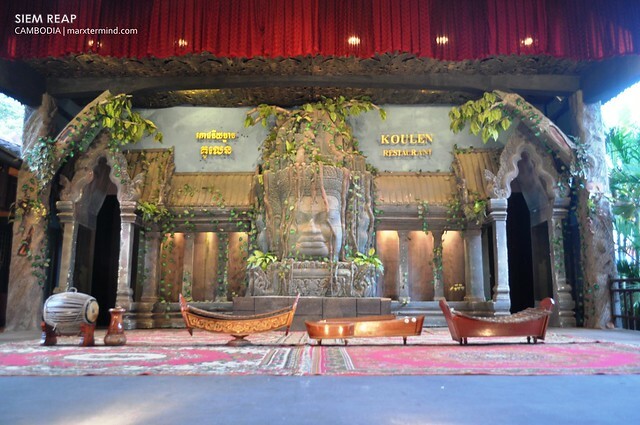 After we had finished visiting Angkor Wat and some of the temples in Angkor Archaeological Park we had prepared ourselves for another activity that day, the dinner buffet and the classical Apsara Dance Show at Koulen II Restaurant. At exactly 6:00 PM, we left Bou Savy Guesthouse and walked for about 5 minutes to get to the restaurant. We were the first guests to arrive in the restaurant. We were then taken to our reserved seats. I actually made a reservation for this as I would like for us to be seated at the middle part for the show. 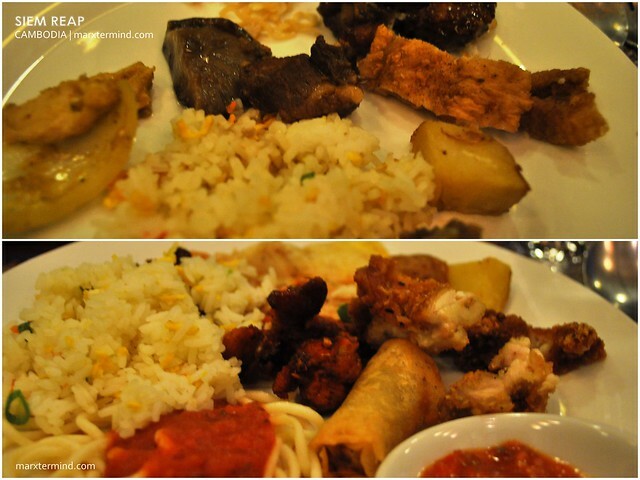 The buffet began around 6:30 PM. 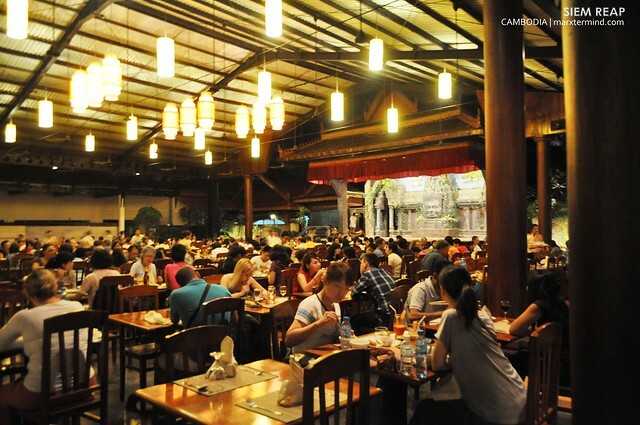 The restaurant serves different cuisines such as Khmer, Chinese, and European food. They do have some desserts too which I suppose are part of the Khmer cuisine. I was able to like some of those; especially the one with green jelly. Anyway, too bad I didn’t take note the names of those deserts. At 7:30 PM, the dance show started. It is said that Apsara is a female spirit of the clouds and waters in Hindu and Buddhist mythology. They are beautiful and supernatural female beings dancing to the music of Gandharvas which usually takes place in the palaces of the gods, entertain and sometimes seduce gods and men. In Cambodia, Apsara represent an important motif in the stone bas-reliefs of the Angkorian temples in Cambodia. 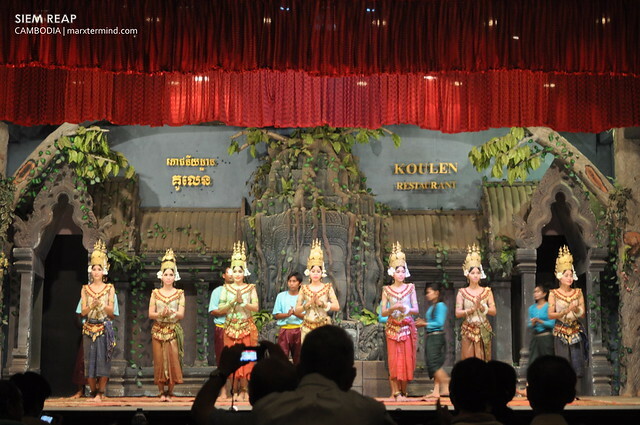 It is said that Khmer female figures that are dancing or are poised to dance are considered apsaras. 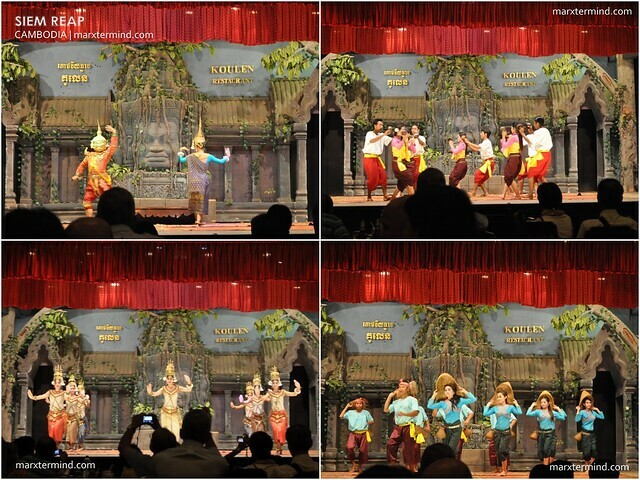 Indeed, the indigenous ballet-like performance art of Cambodia is called “Apsara Dance”. To know more about this, you may visit this link. The classical dance comes into different parts, three or four parts. Each of these dance parts tell a story. The one that I was able to like most is the part where the guy was courting or pleasing the girl. Oh, did I mention that the costumes of those female performers are very elegant and classy?! The dance show is a must try when visiting this country as you will be able to witness a classical show rich in culture; as each movement and steps tell a story. After watching the classical Apsara Dance show, we rode a tuktuk going to the Angkor Night Market. Fare is about US $ 1.00 per person but it’s cheaper if you pay in Riel. It took us about 3 to 5 minutes to get to the area. 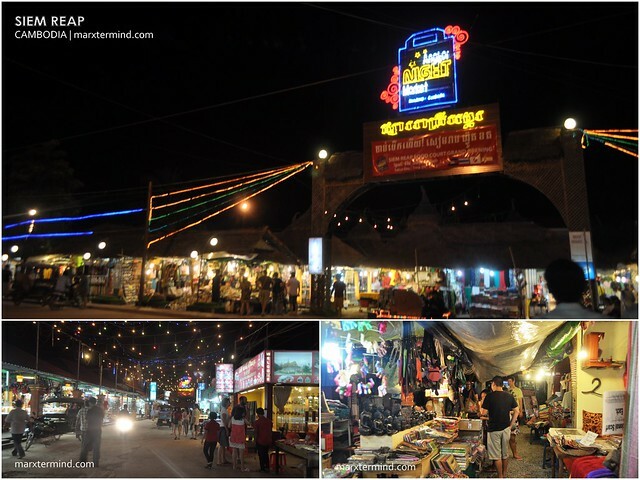 The Angkor Night Market is located at Khum Svay Dangkum, Siem Reap and open from 4:00 PM to 12:00 AM. You might be confused if the tuktuk driver dropped you off the main road which has a lot of night markets around; the place most likely be the old market, the real Angkor Night Market is still located inside as you passed by a street, you may ask around anyway. Here you’ll find cheap items; souvenir items, shirts and bags to name a few. I bought a shirt and a ref magnet to include in my travel collections. All of them for only about US $ 4.00. You can also splurge yourselves for some relaxation treat as there are stalls that offer massages and spa (i.e. fish spa). Me and my friend planned to spend our time for a little bit of drinking session afterwards at the Pub street just to wrap up our visit in Cambodia but we’ve decided not to anymore as we were only left with few dollars or should I say none at all. Well, from being a millionaire in Vietnam we suddenly became a pauper in Cambodia. Anyway, that maybe a reason for me to get back to this place. Anyone? Needless to say, we were still able to enjoy Siem Reap the most out of it despite of our diminishing budget. The Kingdom of Cambodia, formerly Kampuchea, is a Southeast Asian nation that borders Thailand, Laos, Vietnam, and the Gulf of Thailand. The capital city is Phnom Penh. 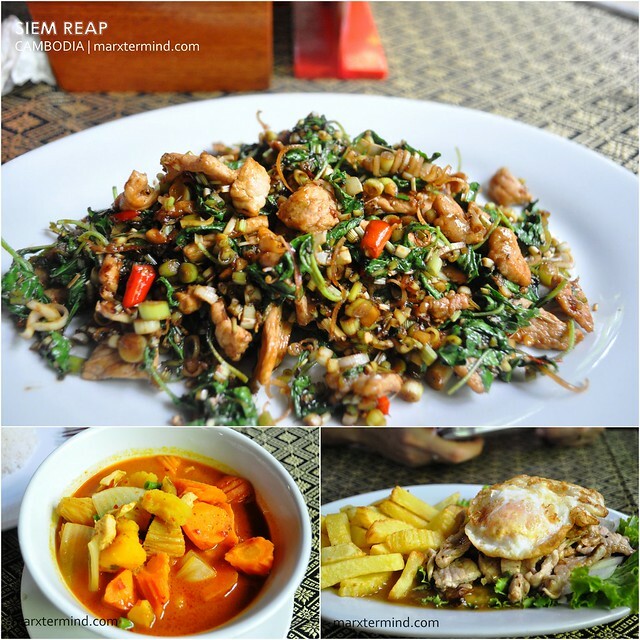 enjoy rin pala mag foodtrip jan sa Siem Reap. Excited na kami!